Justin Trudeau, the Prime Minister of Canada has approached Pope Francis to apologize for the part the Catholic Church played in the decades-long manhandle of native kids in the schools it administered. In the late nineteenth century around 150,000 offspring of Canada's local individuals were put in private schools in an administration endeavor to strip them of their customary societies and familial dialects.Canada’s Truth and Reconciliation Commission said in a 2015 report that the institutions which were government-funded, were administered by Christian churches which predominantly consisted of the Roman Catholic tradition. According to the report, many children were physically and sexually abused in the institutions. 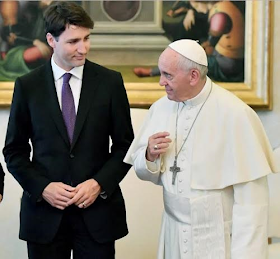 The Canadian Prime Minister on Monday met with the pontiff at the Vatican as part of his visit to Italy for the G7 summit in Taormina over the weekend. He told the Pope Francis to come to Canada to apologise as it was important he tenders an apology to help make genuine progress on resolution and reconciliation with the Aboriginal population in Canada.